Each year, the teaching team and department heads and I sit down and outline a calendar for the year. This calendar includes all of the “Big Stuff” we’ll do over the year. Once we have holidays and big events on the calendar, we start planning out series. I’ll talk more about how we do that later in the series. We set dates, main points, and main scripture for the entire series. 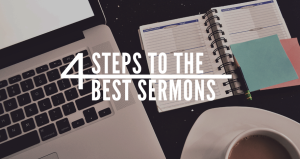 We’ve come up with a system of outlining a sermon that seems to work well with people’s way of thinking, attention spans, and application. We’ll break that down later too. Does your church have a system for this? I’d love to hear about it!